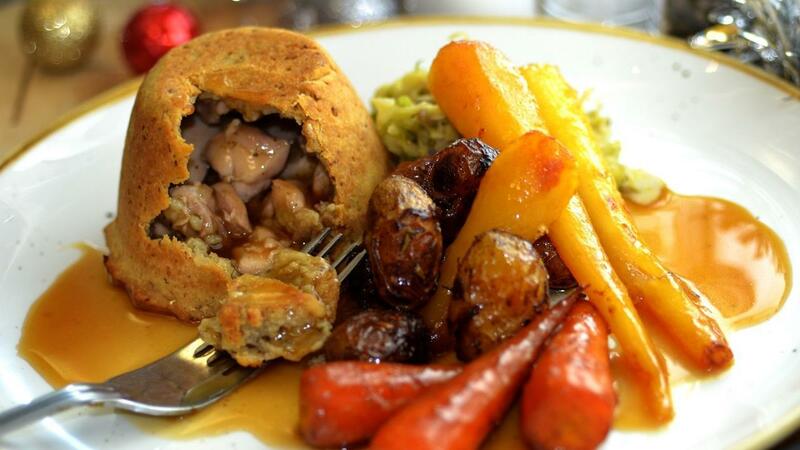 This recipes combines all the flavours of Christmas but in a pub classic pie. Blitz the chestnuts until fine and fold into the flour. Rub the MEADOWLAND professional into the flour mix until it resembles fine breadcrumbs. Add one egg and enough water to form a dough. Bring the pastry together then wrap in cling film and chill for 1 hour. Place the KNORR Chicken bouillon and water in to a saucepan and bring to a simmer. Add the turkey and allow to poach for 10 minutes. Strain the cooking liquor into a clean pan then return to the heat and bring to the boil. Stir in the COLMAN'S Sage & Onion stuffing and allow to thicken slightly. Remove from the heat and add the cranberries. Mix the turkey with the sauce then chill until needed. Roll out the pastry then line the pie dish. Spoon the filling into the pastry case. Brush the rim with egg wash then roll out the lid and place on top. Crimp the edges then brush the top with more egg wash.
Bake the pies for 30-35 minutes at 170c. Remove the pie from the oven and allow to rest for 5 minutes before un-moulding. Place onto a serving plate along with all the traditional trimmings.